The lotus, a metaphor for the unfolding of life and spirit, a timeless passage. As in all forms of nature, I begin as a seed and emerge gradually seeking light, my spirit rejoicing upon glimpsing something greater than myself – God, Goddess, All That Is – The Source. In my daily life, with heart, hand and spirit in alignment, I am at my best. Through creativity, meditation, and communing with nature, I seek divine clarity, and with luck, tap into the Collective Unconscious – source of inspiration. I have used the Lotus as image for many years, and keep returning to it again and again. This timeless symbol finds its way into my prints, paintings and drawings creating a spiritual space for meditation.This simple floral shape associated with Buddha nature transcends its earthly role. 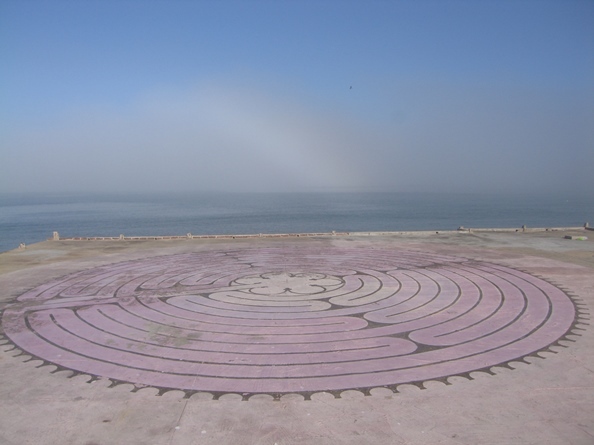 I first discovered the Labyrinth as a spiritual tool in my readings on archetypal symbols. Based on a circle, it implies unity and wholeness, and is considered a metaphor for our journey through life. 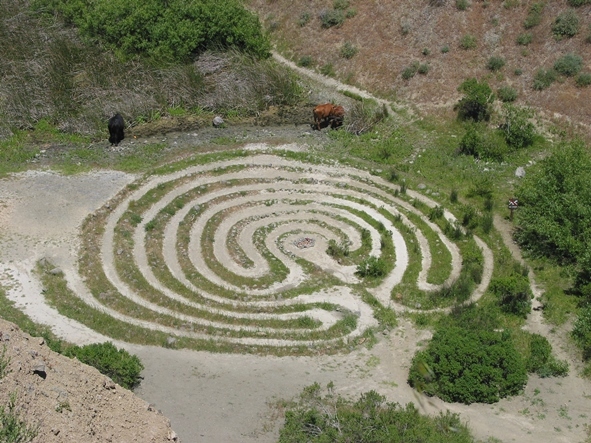 Dating back to the goddess culture of Minoan Crete, the Labyrinth was also used in medieval times as a walking meditation and was often included in the final steps of a sacred journey or pilgrimage. These large-scale symbols were imbedded into the stone floors of monasteries and churches, with the better known being Chartres Cathedral in France, whose Labyrinth continues to receive visits from pilgrims to this day. My first opportunity to walk a Labyrinth was on a New Year’s Eve at Grace Cathedral in San Francisco – it was a profound experience. Sometime later, I had the honor of attending a Women’s Quest with 100 women at the same cathedral – a sort of spiritual “slumber party,” an incredible evening of empowerment, with silent meditations, walking the Labyrinth by candlelight and making connections with like-minded women of all ages and backgrounds. 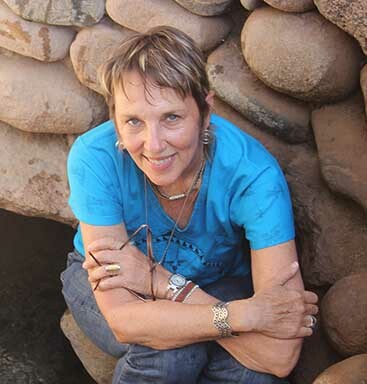 Dr. Lauren Artress, who organized the Women’s Quest, is responsible for bringing the Labyrinth to Grace Cathedral and helped revive this ancient spiritual tool with her book, Walking the Sacred Path. Some of her suggestions for taking this journey include quieting the mind, asking a question, repeating a mantra or prayer and allowing a receptive state. Walking towards the center is an opportunity to let go of things no longer useful. Reaching the heart of the Labyrinth, Dr. Artress suggests taking a moment to offer gratitude, and on the final circuit, asking for what you’d like to bring into your life. I never miss an opportunity to walk this mystical path and commune with the divine, knowing that somehow it will affect my life and my art. Here are some works that have the feel of the labyrinth. This post is an excerpt from my book, Art & Sacred Sites: Connecting with Spirit of Place. To order, glen@glenrogersart.com.